DURHAM — Lanya Shapiro wants to lure Generation Xers and Generation Yers into social awareness. But Shapiro doesn’t want to guilt trip young people out of their apathy. She said she wants to incite them, provoke them and invite them to film festivals and dance parties. She wants to make them comfortable, get them thinking. And then, just when they’re having fun, she wants to change the way they think about getting involved. DURHAM – As early voting drew to a close Saturday afternoon, Durham’s elections chief, an unabashed booster for democracy, was even more exuberant than normal. All over the state, Saturday was the last day people could vote early in person. At Durham’s Board of Elections, a modest building on West Corporation Street just west of downtown, a line 100 people long waited to vote. The scene was more like a tailgate party where candidates shook hands and a nonpartisan group of volunteers served food, coffee and music. Hot dogs, veggie burgers, chili and coffee were available at no charge thanks to Traction, a Durham nonprofit that works to get young people involved in the community. Traction also arranged for the Water Callers, a duo who played acoustic folk, country and roots music for the crowd.”We think politics shouldn’t be boring, it should be fun,” said Lanya Shapiro, 36, the group’s founder and director. People who support the increase say it is needed to help workers deal with the rising costs in basic necessities such as food, health insurance and fuel. “We definitely need the increase,” said Joseph Costa, a sheriff’s deputy assigned to Jordan High School in Durham and a member of Traction, a left-leaning social network of 20- and 30-somethings. Nice work, officer! Click to read the whole article, including more quotes from Joe. 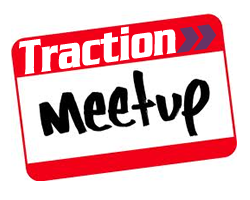 * Traction, a nonprofit group, will sponsor a discussion on economic issues facing young adults. The featured speakers will be Patrick Lyons, author of “Map Your Financial Future: Starting the Right Path in Your Teens and Twenties,” and Tamara Draut, author of “Strapped: Why America’s 20- and 30-Somethings Can’t Get Ahead.” The event will be 7:30 p.m. at Joe & Jo’s, 427 W. Main St., Durham. For information: scott*at*getTraction*dot*org. See it in context here. It’s no secret that it’s often hard for young adults to get ahead financially. Challenges include avoiding credit card traps, coping with rising health insurance premiums, navigating retirement plans and more. The nonprofit group Traction (www.getTraction.org) will sponsor a discussion on economic issues facing young adults next week in Durham. The free event will be held 7:30 p.m. Tuesday, at Joe & Jo’s, 427 W. Main St., downtown Durham. For information, e-mail: scott*at*getTraction*dot*org. A good place to find the unusual gift is at a fundraising auction. Lots of nonprofits have them. A new nonprofit we like, because the cause is teaching progressive political activism, is TRACTION–short for Triangle Action–which is holding its inaugural holiday gift fundraiser-auction. The theme of the event, swiped from a famous Seinfeld episode, is “FESTIVUS FOR THE LEFT OF US.” So look for a few good “Festivus” traditions, like the annual “Airing of Grievances,” Traction founder Lanya Shapiro says. Among the donated gifts so far: Rock-climbing lessons, handyperson help, a two-hour massage/acupressure session, and a week in a western North Carolina mountain house. Traction (www.getTraction.org) mixes good times with politics for the 20- and 30-something crowd. But olders and elders are most welcome at this event too, Shapiro says. Especially if they come to buy! Think globally and shop locally on Saturday, Dec. 10 from 4:30-6:30 p.m. at the Broad Street Cafe, 1116 Broad St., Durham, 416-9707. Three Durham-based groups organized the trip. Lanya Shapiro, founder of a newly formed activism group called Traction, said she wanted to show that North Carolina had a large number of people opposed to the war despite being home to a number of military bases. Yesenia Polanco, a 22-year-old law student at the University of the District of Columbia [and founding member of Traction], met up with the group from her hometown of Durham to help show how important demonstrations were in getting messages to elected officials. “We’re here to join the rest of America against a war that should never have started,” Polanco said. The group also stopped at Eileen Thorsos’ apartment, one of two homes on the tour using passive solar energy. Among the features were a wall of windows on the south side of the apartment, allowing optimal sun exposure in both the summer and winter. The brick floor also acted as a thermal mass, absorbing and then radiating heat to help keep temperatures constant. “I think people should be demanding this kind of construction, because it’s not expensive, but it’s very effective,” Thorsos said. Lanya Shapiro: You may recognize her e-mail address, givebushtheboot(at)earthlink(dot)net. I think of her as Durham’s answer to Blaise Strenn of Raleigh (an Indy “Citizen Award” winner in ’04), the hardest-working progressive activist in the Bull City. Anyway, Shapiro’s starting Traction – short for Triangle Action – “to jump-start civic engagement among 20-something and 30-something progressives.” (Guess I’ll have to start Re-Laxion, for the over-50 set, myself.) Her idea is to make politics hip with movies, open-mic nights, cool speakers, even a dodgeball team, while also letting folks share information about their local issues and candidates. “It’s about watching Baked Alaska, a movie about global warming, and then working to get an HOV lane on I-40,” Shapiro says. She could use some help, including $$$. Or, for that matter, $$. For starters, drop her a note and get some traction. If you’d like to contribute some $$$ (or $$), THANK YOU!! Click to make a deposit in the karma bank.